Alan Clyne & Harry Leitch pulled off a major upset on the first day of knockout action in the Commonwealth GamesSquash Doubles when the Scots downed England’s third seeds Peter Barker & Daryl Selby in straight games to reach the Men’s Doubles semi-finals for the first time at the Siri Fort Complex in Delhi. Barker, the world No8 who won the singles bronze medal last week, and his Essex close friend Selby, ranked 10 in the world, were highly regarded as doubles medal prospects in the Indian capital. But Scotland – which boasts only one doubles court, off the Scottish coast on the Shetland Islands – has targeted doubles as its specialist area. Unranked Leitch, a postgraduate medical student at Cambridge University, and Clyne, the world No50 from Inverness, showed this conclusively as the pair carved up the experienced Englishmen 11-7, 11-7 in 69 minutes. “Doubles is so different from singles – and we’ve worked really hard on it,” said an ecstatic Leitch afterwards. “We fight for each other – and as I don’t play full-time, maybe I just want it more than the others. “When you get to the quarter-finals, it’s tiny things that make the difference,” added the Edinburgh-born 25-year-old who is studying for a PhD in developmental and embryonic stem cell biology. So how does this win rate amongst his career squash successes? “This is it. The highlight before was making the quarter-finals with John White in 2006 – so this surpasses that! “I consider myself very lucky that I get his opportunity to play for Scotland,” concluded Leitch. It was a crestfallen Barker who tried to describe what had happened: “It’s not squash – it’s a totally different game. Technique doesn’t come into it – especially on these courts,” said the 27-year-old left-hander. “They’ve perfected the art of playing doubles. It’s frustrating, and embarrassing, to be honest. Earlier, second-seeded English pair Jenny Duncalf & James Willstrop made up for the disappointment of a shock Pool loss by beating Guernsey duo Zephanie Curgenven & Henry Birch 11-4, 11-2 to earn a place in the quarter-finals – where they will face the top-seeded Australians Kasey Brown & Cameron Pilley. 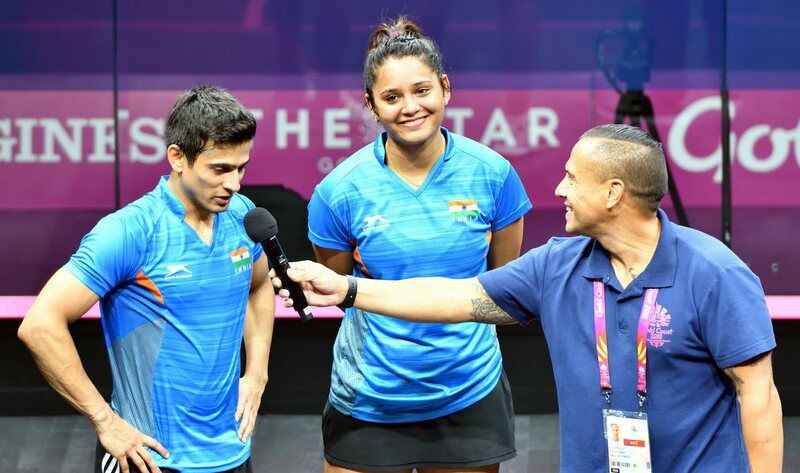 Indian hopes are now resting exclusively on the shoulders of Joshna Chinappa & Saurav Ghosal. The fourth seeds claimed a place in the last sixteen of the Mixed event after a final qualifying round win over Scottish pair Frania Gillen-Buchert & Alan Clyne – and were then handed a bye through to Tuesday’s quarter-finals. The local stars will face Nicol David & Ong Beng Hee, the third seeds from Malaysia featuring the women’s gold medallist. “Playing Nicol and Beng Hee is going to be a tough match – they are both very good,” said Ghosal, the world No26 from Chennai who is India’s highest-ranked player of all-time. “It’s going to be tough for us – we’ll have to play really well. “Having the hopes of India on us won’t really change things – we want to win anyway. There’s pressure of course, but we’re both used to it and are able to handle it well. We can use the crowd support to our advantage. Nicol David & Ong Beng Hee also suffered a surprise early pool defeat – but have bounced to reach the last four as expected following their 11-7, 11-3 defeat of England’s Sarah Kippax & Adrian Grant. “I thought it was tough on Nicol to have to play against the seeded Scots straight after winning the gold medal, but she’s got better now that we’ve got into it,” said Ong Beng Hee, the Penang-born world No17. “But we’re having great fun – and that’s what it’s all about.